Earthquakes are unique challenges for schools. Unlike other natural or man-made hazards, they occur with no warning. Schools cannot be closed in advance, nor evacuated. However, with proper training and planning in advance, everyone in your school community can be prepared to react appropriately during and after an earthquake, with appropriate supplies on hand. This lesson provides an overview of school earthquake preparedness and provides resources for use in incorporating earthquakes into your overall emergency plans. This lesson is organized according to the following framework, used by emergency managers around the world. While there are distinct activities within each phase, they are truly interconnected. Without prevention and preparedness, response, and recovery will be far more challenging. Likewise, planning how your school community will respond to an earthquake will identify key resources that must be prepared in advance, whereby recovery will be much faster as a result of proper execution of the other phases. Identifying all potential hazards and vulnerabilities and reducing the potential damage they can cause. Collaborating with community partners to develop plans and protocols to prepare for the possibility that the identified hazards, vulnerabilities or emergencies will occur. Working closely with first responders and community partners to effectively contain and resolve an emergency in, or around, a school or campus. Teaming with community partners to assist students and staff in the healing process, and restore a healthy and safe learning environment following an emergency event. Are you at risk for earthquakes? If you are in an area where earthquakes are frequent, you likely have already included earthquakes in your overall emergency plan. Your buildings are also likely built to a higher standard of construction due to strict building codes. But what about other areas of the country? Some areas indeed have a potential for damaging earthquakes, even though there may be no or little activity for many years. 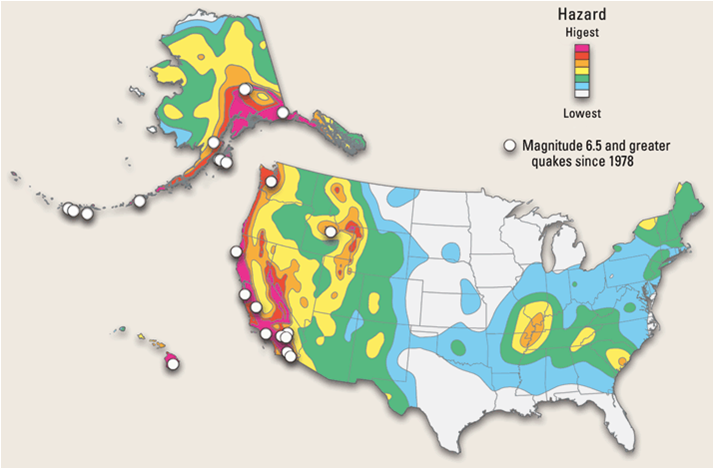 The map at right, by the U.S. Geological Survey, shows which areas are most likely to be shaken by earthquakes, and where earthquake hazards are low. "High" hazard does not guarantee an earthquake soon, but it is more likely than other areas. Similarly, "low" hazard does not mean an earthquake will never happen, or that big earthquakes are not possible. For almost every state, there is a chance that a damaging earthquake could happen today. However as the image shows, earthquake hazard is higher along the west coast and Alaska, because of tectonic plate boundaries where slow shifting of plates causes faults to rupture into larger earthquakes, which are more frequent. 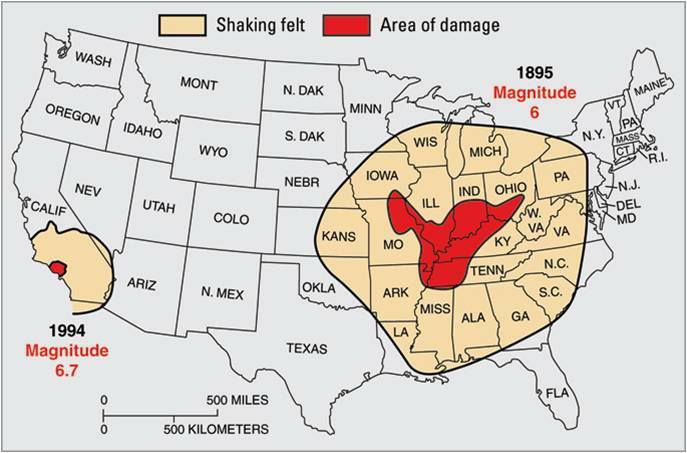 The Central United States has a moderate to high earthquake hazard becuause of its history of earthquake activity, especially a series of large earthquakes from 1811 to 1812. The east coast has occasional moderate-sized earthquakes and rare larger earthquake events, as compared to its west coast counterpart (i.e. magnitude 7.3 Charleston, S.C. earthquake). Because of differences between the structure of the earth under western states compared to central and eastern states, earthquakes in the west shake smaller areas than similarly-sized earthquakes to the east. The map below shows the area of damage for the 1995 Northridge, California, magnitude 6.7 earthquake, compared to a smaller magnitude 6.0 earthquake in 1895 in the Central U.S. which strongly shook a much larger area. What does this mean for you? Not only may you experience damage from earthquakes centered further away, but if your school or district is in the central or eastern U.S. you will likely be surrounded by a larger area of damage. First responders may take longer to arrive, needed resources (for response as well as for repairing damage) may be limited, and much of your population may leave the area permanently. These issues can occur in the west too, when large earthquakes shake smaller areas. 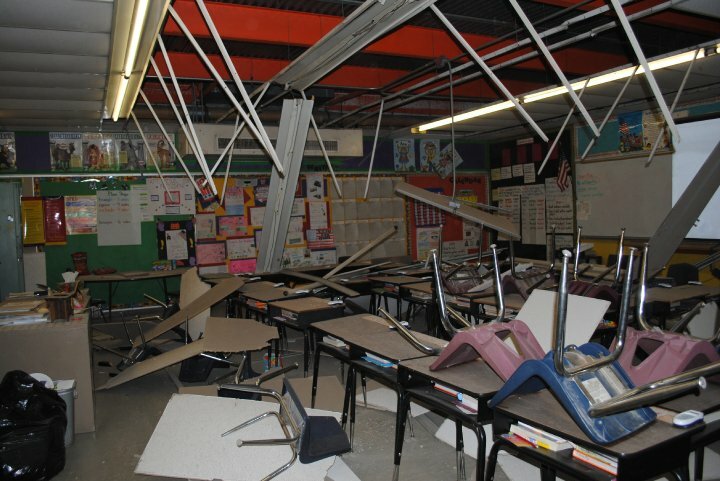 Earthquakes may not only cause damage to school buildings, they also can damage local/regional infrastructure, which may disrupt school facility operations without evident physical damage being present. While your buildings may be well-built and have very little damage in an earthquake, your school may still be unable to resume operations due to damage to utility systems (power, water, gas, communications), hazardous material spills, and other issues beyond your control. These issues may complicate your response and prolong your recovery. Your emergency plan needs to have back-up options in case your normal resources are unavailable. Local/Regional infrastructure issues are beyond the control of school officials, but school buildings are not. Earthquake shaking can damage any building, but some are more likely to be damaged severely (such as brick buildings or others built before modern building codes. Your buildings may seem fine but have been weakened in the main earthquake, only to collapse during a large aftershock. Though complete collapse is quite rare, even minor shifting can cause doors to be jammed, glass to break, and exit routes to be blocked. You should evaluate your school facilities and consult with a structural engineer if possible to determine which are most likely to be damaged. Schools are built to building codes at the time of their construction. Newer codes require better designs to withstand expected levels of earthquake shaking for the area. A school built in California may have stricter requirements than one built in New York, where earthquakes are less frequent and less intense. The goal of building codes is life safety, not continued operation. So new codes may prevent deaths and limit injuries, but your school buildings may still have significant damage. Codes only as good as their enforcement. If contractors "cut corners" to save costs, and this is not noticed by building inspectors, then even new buildings may fail during earthquakes. 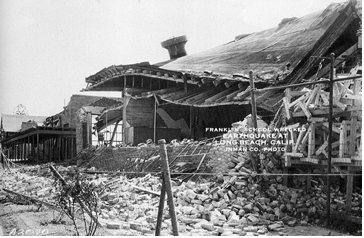 This school was destroyed by the magnitude 6.4 1933 Long Beach Quake (fortunately at 5:54 pm, so no one was present). Because of damage here and to many other schools, the Field Act was passed quickly by California to reduce future school damage. 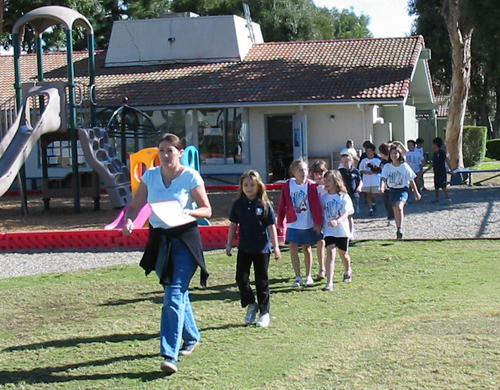 Landers Elementary School was situated less than 0.4 miles from approximately 12 feet of horizontal offset in the magnitude 7.3 Landers Earthquake in 1992, yet had very little damage because of the construction standards required by the California Field Act. School building collapse is certainly a major concern requiring long-term planning and investment toward prevention. However significant injuries and damage may also result when contents within classrooms, offices, and other facilities fall or are thrown during earthquake shaking. Furniture can fall on students or block doorways, and expensive computers and other equipment may be damaged. Chemistry labs and industrial shops have unique hazards to consider. Fortunately, the solutions for preventing most of these issues are relatively inexpensive. 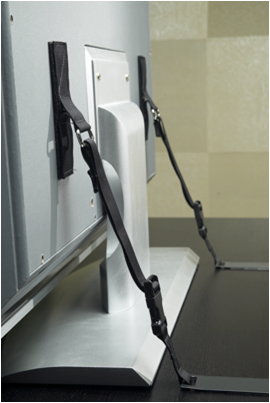 Straps, buckles, and other devices are widely available to secure content within facilities. Companies can be hired to secure furniture and contents in your school buildings, though your maintenance staff are likely capable of installing the necessary equipment. They can be ordered online through many sources, or purchased at home improvement stores. It is essential that commitment to their use must be a long-term policy. When classrooms or offices are painted, furniture is moved, or computers are replaced, it should be required that the straps, brackets, and other solutions be re-installed and the budget should include this work. 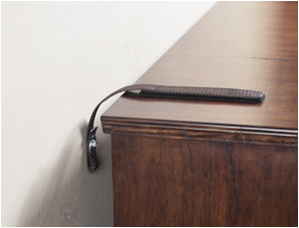 These pictures show a few of the commercial products for securing furniture and equipment. A resource entitled, Guide and Checklist for Non-Structural Earthquake Hazards in California Schools, is a comprehensive publication which identifies potential earthquake hazards associated with nonstructural components of school buildings and further provides detailed instructions for mitigating those hazards. 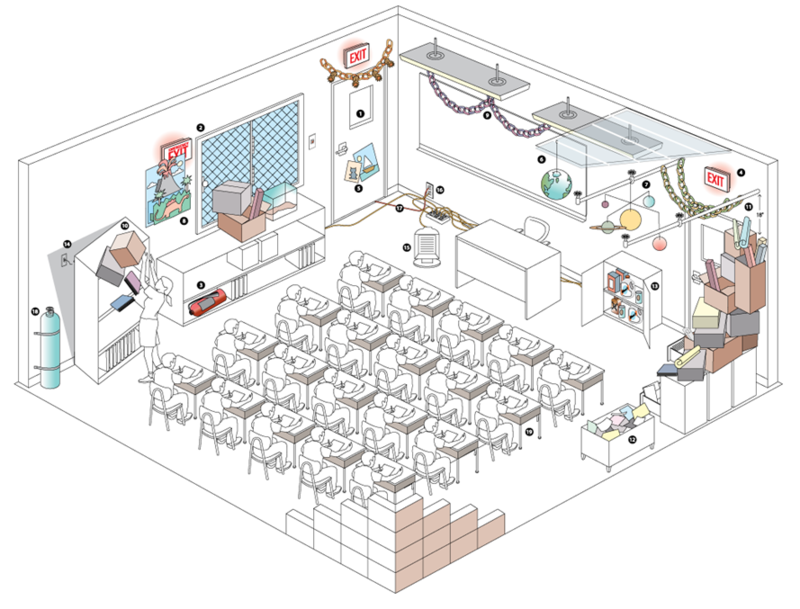 A useful asset to this resource is the Earthquake Hazards Checklist to assist staff in conducting a nonstructural hazards survey for each room within the educational facilities. In addition to furniture and other permanent items, classrooms and offices should also consider other safety issues. Storing educational materials "out of reach of children" may seem wise until they fall during an earthquake. 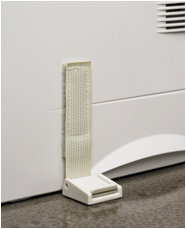 Consider lockable cabinets instead. DO NOT stack things above head level. DO NOT block emergency exit signs or passageways. DO keep your fire extinguisher in operating condition and strapped to a wall. By following these protocols, schools will support the efforts of first responders and local emergency managers. For this reason, personnel must be trained in the implementation of NIMS, and in particular the Incident Command System (ICS), a standardized approach within Command and Management. Regular training in conjunction with community partners and frequent updates to the school emergency plan are essential to better integrate NIMS and ICS. Extensive documentation and resources for school implementation of NIMS are available from the REMS Technical Assistance Center. Alongside school implementation of NIMS, your plan should include making arrangements (in advance!) with structural engineers or contractors to report to your school to help determine the severity of building damage. Most states require several fire drills a year, perhaps monthly. Fewer states require earthquake "Drop, Cover, and Hold On" drills. While fire and earthquake drills are often held separately, in a real earthquake a fire may be started such that during the shaking the concern is falling items but immediately after the concern may shift to fire evacuation. 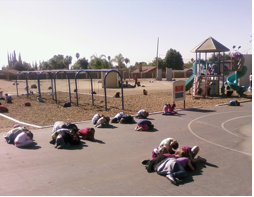 Schools often include building evacuation as a part of their earthquake drill, since assembling in a common area after an earthquake will be the best way to account for students, prioritize first aid and triage, and conduct search and rescue. After a damaging earthquake, your students and staff may need to stay on site for several days until parents and emergency responders can arrive. 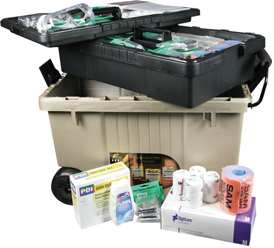 Two important factors must be considered for emergency supplies: a secure storage location and an adequate amount of supplies. School officials should be prepared to be self-sustaining for a minimum of 3 days in times of an emergency. The assigned team (as delegated in the NIMS Command System) is responsible for the procurement, storage, and maintenance of specific supplies for earthquake preparedness. Their team responsibilities further include keeping supplies fresh, especially first aid, food and water, and maintaining an accurate, on-going inventory of supplies. However your teams will need additional supplies and equipment according to their required tasks. The Arkansas School Earthquake Preparedness Guidebook has an excellent list of equipment and supplies for various teams. The Guidebook also has thorough recommendations for storing and providing food, with formulas and tables for determining needed quantities. These guidelines will likely be sufficient for any emergency situation. 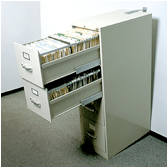 Where your supplies are stored should depend on your needs and facilities. Because earthquakes may damage buildings, ideally your storage location should be outside. 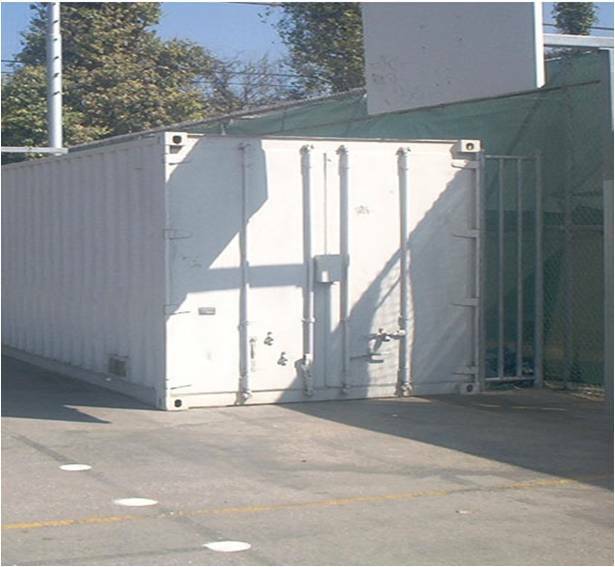 For example, a cargo container of emergency supplies is on every school campus in Los Angeles Unified School District. Each can be locked, is waterproof, and can hold a large amount of supplies and equipment. You can also store supplies in multiple locations that will be accessible. 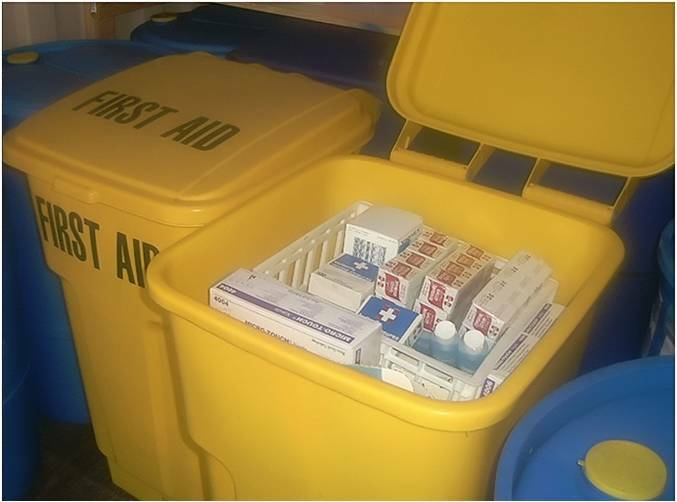 Some schools use (new) trash barrels with wheels (see first aid kit photos below). Classrooms should also have a "go kit" with student information (names, special needs, etc. ), basic first aid supplies, whistle and hat (for identifying the teacher), and more. Many schools also require each student to have personal "go kits" as well, such as a backpack with supplies, extra clothing, prescriptions, etc. Also, be sure to store enough paper cups for everyone to use for several days. You should encourage students and staff to keep and reuse their cup. 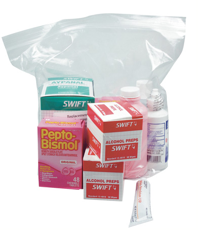 Large commercial first aid kits should also be stored in each cargo container. Such kits are typically sufficient for up to 400 people, though this does not mean 400 injuries. The kits assume only a portion of the people will require first aid. Replace expired items immediately; or preferably before they expire! Include timelines in your emergency plans for when to replace perishable items. In an emergency, you will need an area for a latrine if toilets are not working because the water supply is out or if bathrooms are not accessible. 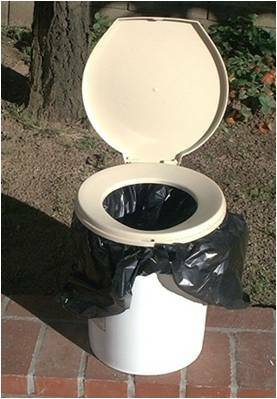 Simple "bucket" toilets can be used to store supplies until needed. The ideal ratio is 1 bucket for every 30 people. In addition to the bucket itself, be sure to store toilet paper, a privacy partition (such as a tarp or large cardboard enclosures), hand sanitizer gel, and other related items. Working closely with first responders and community partners to effectively contain and resolve an emergency in, or around, school facilities. In managing educational facilities, the most important aspect of earthquake response is preventing injuries and deaths due to structural or building contents. Because earthquakes strike without warning, students and staff must know how to protect themselves with little or no time for instruction. Fortunately, the largest earthquake waves usually follow an initial "jolt", perhaps with a few seconds in between or even longer if the earthquake is further away (similar to the delay between lightning and thunder). So this may allow enough time for getting into a safe position. Studies have shown that most people are injured by falling contents or by trying to move to another location, such as running outside. Moving can be very difficult during strong shaking, and the periphery of buildings is the most dangerous place for falling building components, especially in brick buildings. The safest action in most situations is to Drop, Cover, and Hold On. Stay in place during earthquake shaking! before the earthquake drops you! Step 5 of the Seven Steps to Earthquake Safety describes what to do in various situations (in bed, at the theater, etc. ), when you feel earthquake shaking. If you are in a room with 25 students, how many can fit in the doorway? 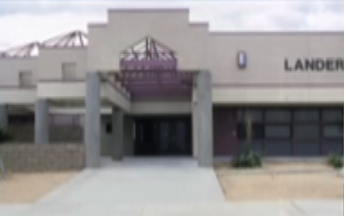 DO NOT believe the "triangle of life"
The photo on the left below is a school in Calexico, CA, showing how ceilings will collapse in pieces, but desks provide shelter. The photo on the right below is a school in Mexico City. 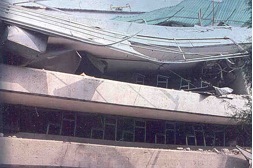 The floors collapsed in the 1985 earthquake, but the tables held up the concrete slabs. The "Triangle of Life" theory says that buildings always collapse and crush tables, so you should be next to the table to be in a "triangle of life". As the pictures shows, this just isn't true. Plus you can't predict where such a space would be when the shaking starts. The Earthquake Country Alliance (California) has developed a special report on what to do during earthquakes, and what not to do. 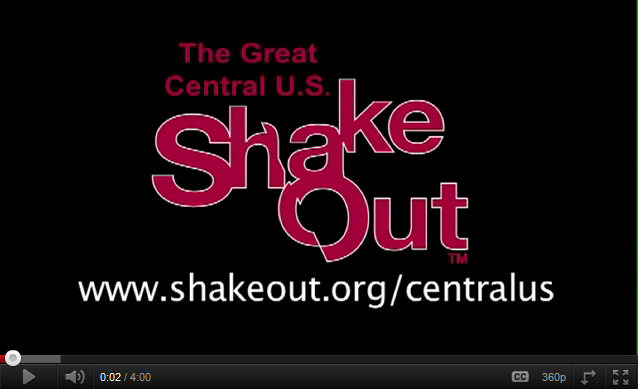 The ShakeOut is a yearly chance to practice how to protect ourselves during earthquake! Once the earthquake has happened and the shaking has stopped, then your plan will likely include evacuating classrooms and administrative offices to central assembly area(s), wherever you go for fire drills. Make sure the area is away from structural facilities, so that you will not have to worry about aftershocks. The following instructions are for classroom teachers but can be modified for administrative officer and other school locations. After shaking stops, assess your room for any dangers (broken glass, fallen items, fire, chemical spills, etc.). Deal with anything urgent if possible, quickly. NEVER evacuate automatically; there may be more danger outside than there is inside. Check for safe passage/clear exit route from your room to the assembly area (look out the door/window; don't leave children unsupervised). If an aftershock occurs while you are exiting, Drop, Cover, and Hold On until the shaking stops. Do not use any elevators. Once to the assembly area, quickly advise search and rescue teams to return for those who did not exit with the class. Instruct students so they know that if there is an earthquake when they are outside of a classroom (such as during break or lunch), they should exit with the nearest class and should NOT go back inside. If they are between classes, they should assemble in the outdoor emergency assembly area with their next period class. Fires often start in the aftermath of an earthquake because of ruptured gas lines, the content of rooms, things left cooking on the stove, and electrical fires. Thus, fire constitutes a fairly great risk after an earthquake. 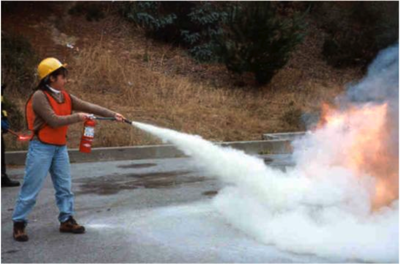 Many teachers and school staff members have never handled a fire extinguisher, so make sure that your staff is prepared and trained in their proper use. One training opportunity is to ask the technician who comes to cycle out your old extinguishers and replace them with new ones to provide a training demonstration. This is a great chance for teachers and staff to safely practice using a fire extinguisher. Involving your local fire station is another option, which has the added benefit of creating and maintaining a working relationship with your local fire station. 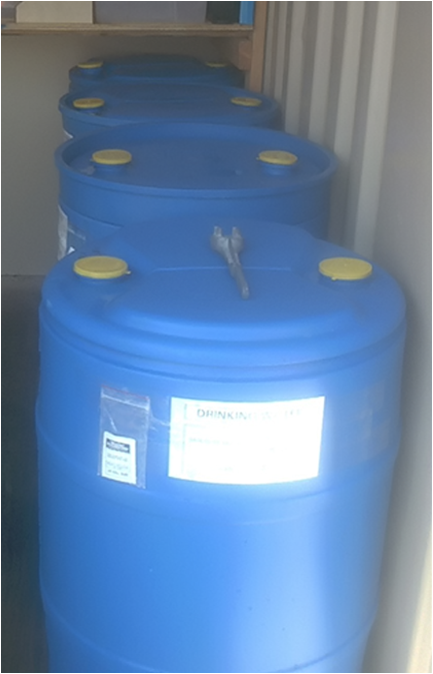 Evaluating potential release of chemicals. Locating and extinguishing small fires as appropriate. Checking gas meter and, if gas is leaking, shutting down gas supply. Shutting down electricity only if building has clear structural damage or advised to do so by the incident commander. Posting yellow caution tape around damaged or hazardous areas. Several questions must be answered before deploying Search and Rescue teams. Is it safe to conduct search and rescue? How damaged are your buildings? Who is making those determinations? One simple qualification for a Search and Rescue team to enter a damaged building is that it needs to have all four walls and its roof, and should not be leaning at an extreme angle. Buildings in such condition should be left to professionals to enter. As is said in the fire service: "Never bring victims to a scene." The individuals acting in a rescuer capacity should not put themselves in a situation where they can also be injured. Basic hand tools - for light search and rescue. It often happens that an entire class is unable to leave their classroom because a doorframe became tweaked in the shaking. These are the first cases that should be attended to. Send one of your search and rescue teams directly to those classrooms and have them use a prybar to pop the door open, then send those students and teacher out to the assembly area with everyone else. When a team goes in to do a search, they should use the "go right, stay right" strategy. It can be dark in an earthquake, even if it's daylight, because of the smoke, power outage, etc. With the contents shifted, it can be easy to get lost, even in a small room. As your team members enter, they should keep their right shoulder against the wall on their right and follow all the way around back to the door they started from. To search the center of the room, walk straight forward from a wall and then return to the same spot. Handling the physical/site assessment successfully is an important aspect of your emergency plan. This is also an important phase to include stakeholders in assessing possible vulnerabilities/hazards of the district's educational facilities. Review the following resources for details to consider and recommend policies/procedures. Your school's emergency plan is a living document; changes in staff, facilities, and your local community should prompt updates to your planning process and facilitate practical training. Your plan is only effective if it is seen as a process and not a product to be used only when needed. The process should include the following action steps as described in this course. Many of the resources listed throughout this course cover all of these steps, though some may focus on certain aspects better than others. It is up to your school or district to develop your plan according to your specific needs. Know where your emergency supplies are located, make sure they are sufficient for your needs, and are not expired. This manual is intended to provide guidance for the protection of school buildings from natural disasters. This volume concentrates on grade schools, K-12. FEMA P-424 covers earthquakes, floods, and high winds. Its intended audience is design professionals and school officials involved in the technical and financial decisions of school construction, repair, and renovations. NOTE: This publication is available free to Local and State government staff. All other interested parties can obtain this publication via online download only. Presents an international framework of guiding principles and general steps to develop a plan to address the disaster resilient construction and retrofitting of school buildings. The guidance notes consist of four components: 1) General information and advocacy points addressing the need and rationale for safer school buildings, along with success stories and list a number of essential guiding principles and strategies for overcoming common challenges. 2) A series of suggested steps that highlight key points that should be considered when planning a safer school construction and/or retrofitting initiative. Each step describes the processes, notes important decision points, highlights key issues or potential challenges, and suggests good practices, tools to facilitate the actions, and references resources to guide the reader to more detailed and context-specific information. 3) A compilation of basic design principles to identify some basic requirements a school building must meet to provide a greater level of protection. 4) A broad list of references to resources for more detailed, technical and context-specific information. FEMA 395 has been developed to provide school administrators with the information necessary to assess the seismic vulnerability of their buildings, and to implement a program of incremental seismic rehabilitation for those buildings. Part A, Critical Decisions for Earthquake Safety in Schools, is for superintendents, board members, business managers, principals, and other policy makers who will decide on allocating resources for earthquake mitigation. Part B, Managing the Process for Earthquake Risk Reduction in Existing School Buildings, is for school district facility managers, risk managers, and financial managers who will initiate and manage seismic mitigation measures. Part C, Tools for Implementing Incremental Seismic Rehabilitation in School Buildings, is for school district facility managers, or those otherwise responsible for facility management, who will implement incremental seismic rehabilitation programs. 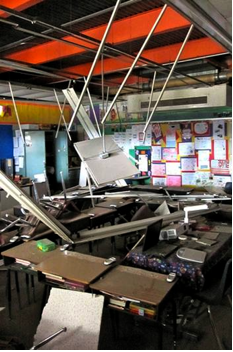 This comprehensive publication identifies potential earthquake hazards associated with nonstructural components of school buildings, and provides detailed instructions for mitigating those hazards. An Earthquake Hazards Checklist form is also provided at the back of the publication to assist staff in conducting a nonstructural hazards survey. One form can be completed for each room within a school building. This new version of FEMA 74 is designed to be used primarily online. The new format makes it simple to browse and to print out the relevant details. The purpose of the document is the same as for the original: to explain the sources of nonstructural earthquake damage in simple terms and to provide methods for reducing potential risks. Since nonstructural failures have accounted for the majority of earthquake damage in several recent U.S. earthquakes, it is critical to raise awareness of potential nonstructural risks, the costly consequences of nonstructural failures, and the opportunities that exist to limit future losses. 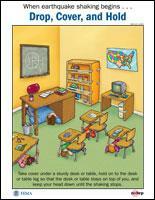 Students will identify hazards in their classroom and in their school. Students will use this information to plan emergency escape routes and plan how to reduce hazards. 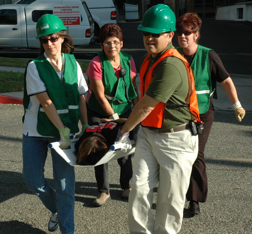 The activity focuses on earthquakes because earthquake preparedness means preparedness for all types of emergencies. The activity includes simple checklists. 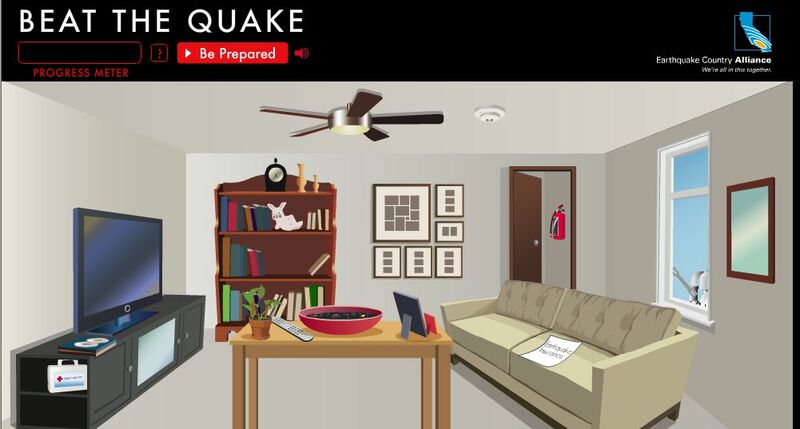 This interactive Flash-based game helps people learn the correct ways to secure furniture and contents, before an earthquake occurs and everything falls that has not been secured. Players can email their score to friends to encourage them to play. A newsletter issue focusing on school emergency plans according to the four phases of emergency management, with an overview of ICS. IS-100.SCa Introduction to the Incident Command System For Schools: How basic ICS principles can be applied in school-based incidents; How to interface with community response personnel. These templates are intended as guidance to school staff and should be adapted according to your emergency plans, local policy, and specific circumstances. This checklist and self-survey is useful for identifying which aspects of your plan need to be improved, or are not included. Sections include assessment and planning, physical and environmental protection, and response capacity development. Includes model preparedness surveys, letters to parents, memos to faculty and staff, preparation and supply guidelines, model emergency response roles and responsibilities, drill evaluation forms and more. These model documents may serve as a helpful guide for schools and districts which do not already have standardized forms. Print version available free in English and Spanish. PDF versions available in English, Spanish, Tagalog, Japanese, Chinese (simplified), Vietnamese, Korean, and Chinese (traditional). This document describes four levels of drills; pick the drill level that makes the most sense for your school or district. Each level builds upon the other and increases in complexity. 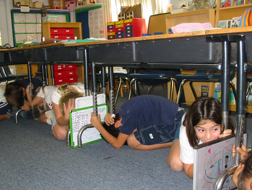 Schools or districts that have been successful with a lower level should consider doing a more advanced drill during the ShakeOut. Provides a summary of supplies to be stored by schools, including administrative and classroom "go kits." A good overview of issues to consider when planning what is needed and how to store it, along with recommended classroom and campus supplies. This document is a template for preparing safe school plans; Volume 2 covers multihazard emergency preparedness and response. It is designed to centralize, organize, and coordinate emergency response among various District organizations and public agencies. It includes descriptions of all teams, procedures for each phase of the emergency, and many form templates. This guide covers all aspects of emergency and crisis planning, with useful recommendations for managing response (section 4) and recovery process (section 5)), including examples from schools and districts. A presentation covering these components, how to prepare for managing each, and provides an interactive exercise for developing a Continuity of Operations Plan (COOP). This short video shows a "Drop, Cover, & Hold On" drill in action and talks about why this is the recommended method for protecting yourself during an earthquake.